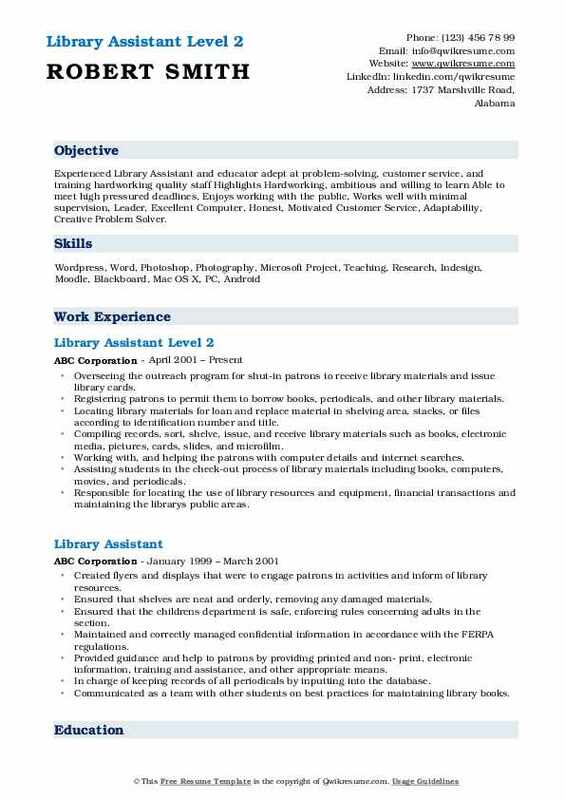 A Library Assistant will aid the Librarian in managing and operating the library. The primary duties involve helping patrons in locating books, checking the books that come in and go out of the library and shelving books in a categorized manner. 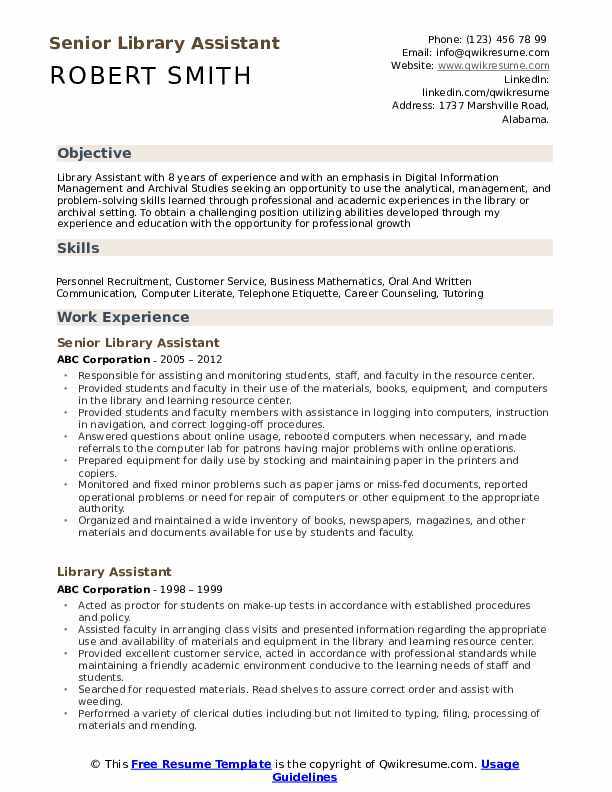 The Library Assistant Resume gives a list of the following duties as well – assisting customers in finding materials online, registering new customers and updating customer profiles, inspecting the condition of the books, assisting with library events, managing fee payments, cataloging audio-visual materials and new materials and managing inquiries of the customers. 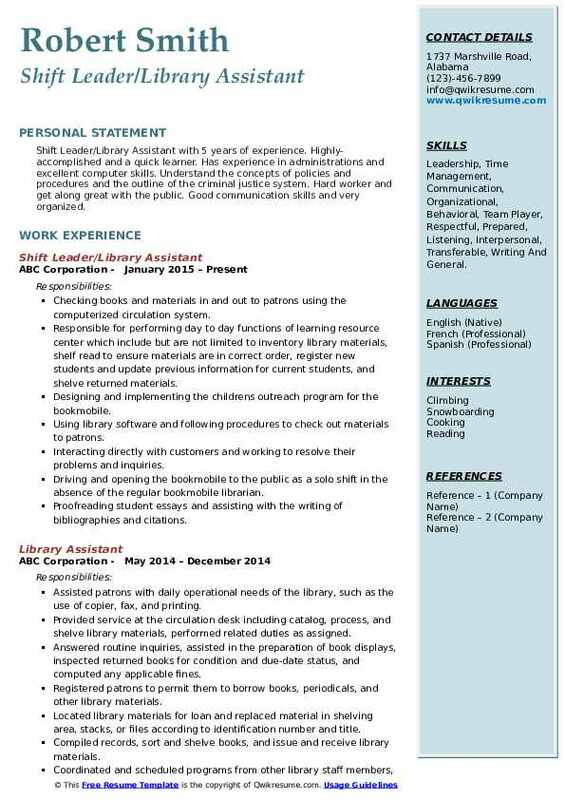 A well-drafted resume for the post should contain job assets such as – customer service experience, basic computer literacy, active listening skills, reading comprehension, and the ability to learn new software pertaining to the field. As these assistants are given on-the-job training, a high school diploma or a GED is the minimum needed qualification. Responsible for assisting and monitoring students, staff, and faculty in the resource center. Provided students and faculty in their use of the materials, books, equipment, and computers in the library and learning resource center. Provided students and faculty members with assistance in logging into computers, instruction in navigation, and correct logging-off procedures. Answered questions about online usage, rebooted computers when necessary, and made referrals to the computer lab for patrons having major problems with online operations. Prepared equipment for daily use by stocking and maintaining paper in the printers and copiers. Monitored and fixed minor problems such as paper jams or miss-fed documents, reported operational problems or need for repair of computers or other equipment to the appropriate authority. Organized and maintained a wide inventory of books, newspapers, magazines, and other materials and documents available for use by students and faculty. Checked bookshelves for misfiled or misplaced books and corrected as necessary. 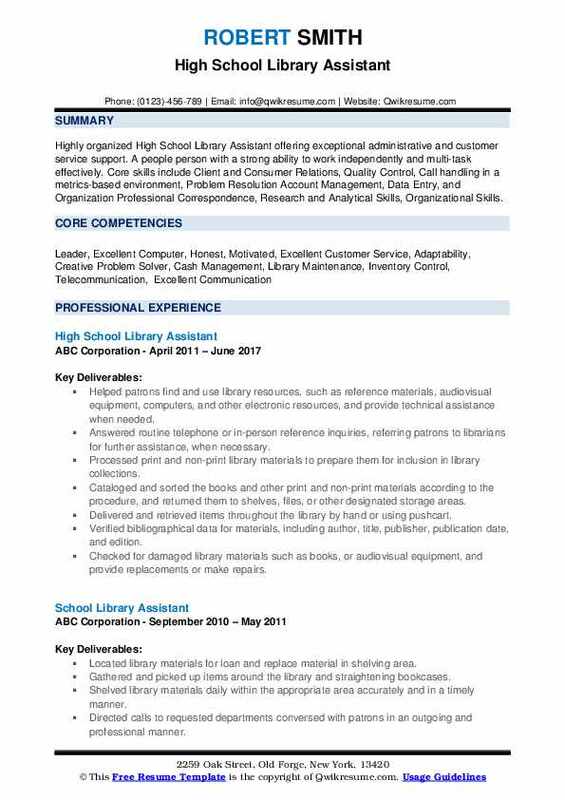 Headline : Highly organized High School Library Assistant offering exceptional administrative and customer service support. A people person with a strong ability to work independently and multi-task effectively. Core skills include Client and Consumer Relations, Quality Control, Call handling in a metrics-based environment, Problem Resolution Account Management, Data Entry, and Organization Professional Correspondence, Research and Analytical Skills, Organizational Skills. Helped patrons find and use library resources, such as reference materials, audiovisual equipment, computers, and other electronic resources, and provide technical assistance when needed. Answered routine telephone or in-person reference inquiries, referring patrons to librarians for further assistance, when necessary. Processed print and non-print library materials to prepare them for inclusion in library collections. Cataloged and sorted the books and other print and non-print materials according to the procedure, and returned them to shelves, files, or other designated storage areas. Delivered and retrieved items throughout the library by hand or using pushcart. Verified bibliographical data for materials, including author, title, publisher, publication date, and edition. Checked for damaged library materials such as books, or audiovisual equipment, and provide replacements or make repairs. Conducted reference searches, using printed materials and in-house and online databases. 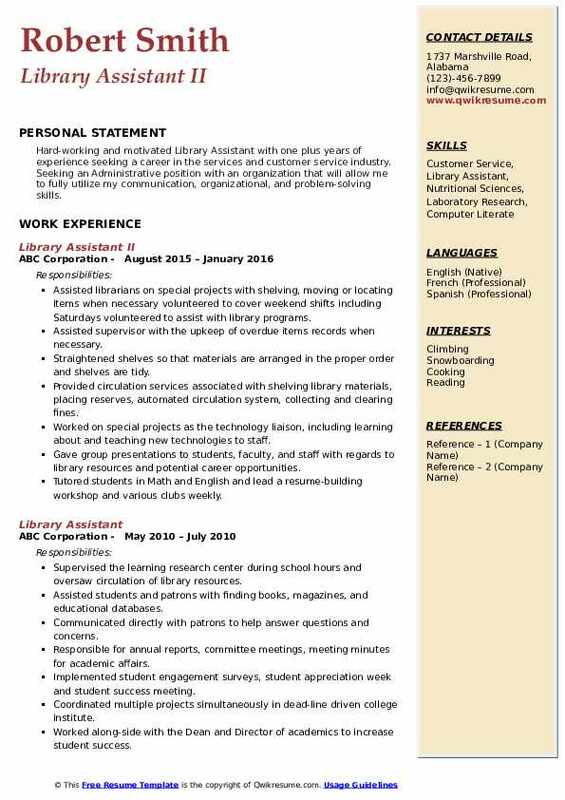 Headline : Shift Leader/Library Assistant with 5 years of experience. Highly-accomplished and a quick learner. Has experience in administrations and excellent computer skills. Understand the concepts of policies and procedures and the outline of the criminal justice system. Hard worker and get along great with the public. Good communication skills and very organized. Skills : Leadership, Time Management, Communication, Organizational, Behavioral, Team Player, Respectful, Prepared, Listening, Interpersonal, Transferable, Writing And General. Checking books and materials in and out to patrons using the computerized circulation system. Responsible for performing day to day functions of learning resource center which include but are not limited to inventory library materials, shelf read to ensure materials are in correct order, register new students and update previous information for current students, and shelve returned materials. Designing and implementing the children's outreach program for the bookmobile. Using library software and following procedures to check out materials to patrons. Interacting directly with customers and working to resolve their problems and inquiries. Driving and opening the bookmobile to the public as a solo shift in the absence of the regular bookmobile librarian. Proofreading student essays and assisting with the writing of bibliographies and citations. Assisting students, staff, and faculty members with locating books, periodicals, journals, and articles specific to their needs. Organizing mail and giving assistance to the supervisor in obtaining serial information such as ISSN numbers. Summary : Experienced Library Assistant and educator adept at problem-solving, customer service, and training hardworking quality staff Highlights Hardworking, ambitious and willing to learn Able to meet high pressured deadlines, Enjoys working with the public, Works well with minimal supervision, Leader, Excellent Computer, Honest, Motivated Customer Service, Adaptability, Creative Problem Solver. Overseeing the outreach program for shut-in patrons to receive library materials and issue library cards. Registering patrons to permit them to borrow books, periodicals, and other library materials. Locating library materials for loan and replace material in shelving area, stacks, or files according to identification number and title. Compiling records, sort, shelve, issue, and receive library materials such as books, electronic media, pictures, cards, slides, and microfilm. Working with, and helping the patrons with computer details and internet searches. Assisting students in the check-out process of library materials including books, computers, movies, and periodicals. Responsible for locating the use of library resources and equipment, financial transactions and maintaining the library's public areas. Sanitizing machinery for work use and oversee orders and organizing products, palletize, line feeder, box machine operator. Disposing of all product waste, clean machines before and after each work day. 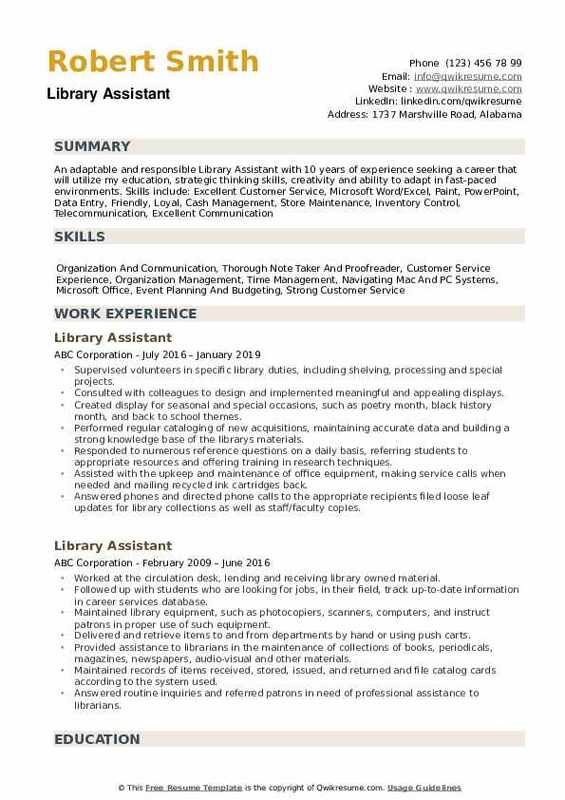 Objective : Hard-working and motivated Library Assistant with one plus years of experience seeking a career in the services and customer service industry. Seeking an Administrative position with an organization that will allow me to fully utilize my communication, organizational, and problem-solving skills. Assisted librarians on special projects with shelving, moving or locating items when necessary volunteered to cover weekend shifts including Saturdays volunteered to assist with library programs. Assisted supervisor with the upkeep of overdue items records when necessary. Straightened shelves so that materials are arranged in the proper order and shelves are tidy. Provided circulation services associated with shelving library materials, placing reserves, automated circulation system, collecting and clearing fines. Worked on special projects as the technology liaison, including learning about and teaching new technologies to staff. Gave group presentations to students, faculty, and staff with regards to library resources and potential career opportunities. Tutored students in Math and English and lead a resume-building workshop and various clubs weekly. Assisted with any technical issues with regards to computer software and hardware. Supervised volunteers in specific library duties, including shelving, processing and special projects. Consulted with colleagues to design and implemented meaningful and appealing displays. Created display for seasonal and special occasions, such as poetry month, black history month, and back to school themes. Performed regular cataloging of new acquisitions, maintaining accurate data and building a strong knowledge base of the library's materials. Responded to numerous reference questions on a daily basis, referring students to appropriate resources and offering training in research techniques. Assisted with the upkeep and maintenance of office equipment, making service calls when needed and mailing recycled ink cartridges back. Answered phones and directed phone calls to the appropriate recipients filed loose leaf updates for library collections as well as staff/faculty copies. Helped people with valuable research that is needed for there schooling.